who commutes everyday and needs a reliable source of energy to power through their work and stay connected. not having to find a wall outlet in a busy airport. your portable electronic devices will always have power. TIO stands behind the quality and functionality of our backpacks for laptops and we offer a one year warranty covering any issues or damages. ⚡ TIRED OF WORRYING ABOUT RUN DOWN BATTERIES? WORRY NO MORE! ⚡ - Students, busy professionals, and travelers all agree having a portable battery pack is a life saver. Stop worrying about running out of power to charge electronic devices. The TIO tech backpack houses all your electronics; cell phones, tablets, and laptops safely. With a removable, portable power bank and a USB Type-C 3-in-1 cable you'll always be ready to power your devices. 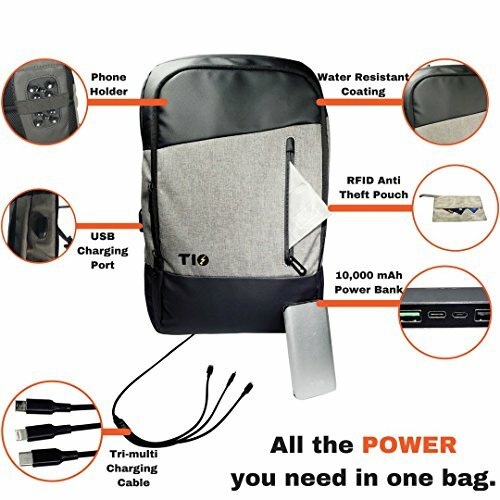 ⚡ ORGANIZE YOUR TECH LIFE AND MAKE TRAVELING EASIER ⚡ - If you're tired of having to carry an external battery charger for every device you own, purchase the TIO backpack with USB port and get rid of the clutter. Safely and conveniently holds a 15.6 inch laptop with padded pockets and compartments to safely store and organize your gadgets while the portable battery charger keeps all your tech devices powered up. ⚡ SAFE, RELIABLE BUILT-IN POWERBANK WITH LED DISPLAY ⚡ - Our portable iPhone charger works with most cell phones because our battery bank features: 2 USB 3.0 Type A ports, 1 USB 3.0 Type-C port, 1 Mini USB port. Easy to read LED lights let you see at a glance the state of charge in your battery bank. Available in 2 capacities 10000mah & 20000mah to suit all your power needs. ⚡ TIO RELIABILITY AND QUALITY + 1 YEAR WARRANTY EQUALS PEACE OF MIND ⚡ - TIO stands behind the quality and functionality of our laptop bag and portable battery and we offer a one year, no questions asked warranty covering any issues or damages. Contact us with any problems and our priority care team will solve any issue. If you have any questions about this product by TIO, contact us by completing and submitting the form below. If you are looking for a specif part number, please include it with your message.